Dover Street in Lower Manhattan is the stuff of historical legend. 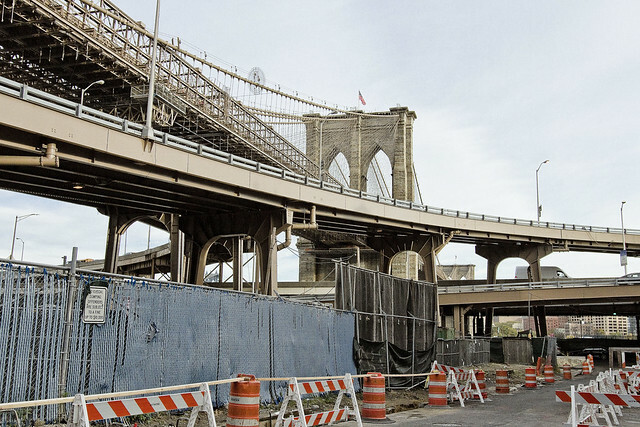 It starts its western path abruptly at South Street, and to the north is the tangled steel of the FDR Drive ramps and the always victorious Brooklyn Bridge. There are buildings on Dover which date back to the late 18th and early 19th centuries. The interesting thing is that they’re not churches, or government buildings, instead they’re shops with homes above. As a note, when the British controlled Manhattan before and during the Revolutionary War, everything in the shot above was pretty much the East River. It’s all landfill, from the modern shoreline west to Front Street, which is coincidentally the corner this shot was captured on, meaning I was standing on the historic shoreline of the island. This is the northern extent of the South Street Seaport Historic District, and Peck Slip is about a block away. Governor Al Smith grew up in this neighborhood in the late 19th century, back when it was still a port, and Tammany ruled it all. Al Smith is buried is buried in LIC’s Calvary Cemetery along the Newtown Creek. The South Street Seaport is a historic area in the New York City borough of Manhattan, centered where Fulton Street meets the East River, and adjacent to the Financial District. The Seaport is a designated historic district, and is distinct from the neighboring Financial District. It is part of Manhattan Community Board 1 in Lower Manhattan, and is bounded by the Financial District to the west, southwest, and north; the East River to the southeast; and Two Bridges to the northeast. It features some of the oldest architecture in downtown Manhattan, and includes the largest concentration of restored early 19th-century commercial buildings in the city. This includes renovated original mercantile buildings, renovated sailing ships, the former Fulton Fish Market, and modern tourist malls featuring food, shopping, and nightlife, with a view of the Brooklyn Bridge. Water Street at Dover is where you’ll find a solid claimant to the title of oldest bar in NYC. It’s the Bridge Cafe, which I’m told is still recovering from Hurricane Sandy damages. The original shell and frame of the building went up in 1794, and was altered steadily until the 1880’s when it assumed its present form. Bridge Cafe has a nice history of the building at their site. Doesn’t mention the great fire of 1835, but there you go. 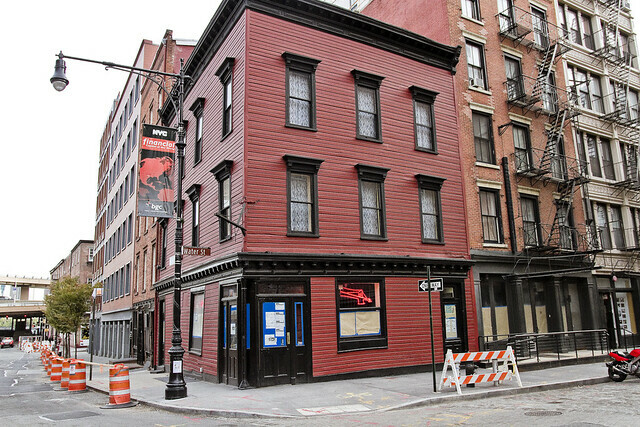 Just down the block, Kit Burn’s “Sportsman Hall” at 273 Water Street was a saloon where you could watch bare knuckled humans boxing, or bet on the canine and rodentine combatants that were fighting in the 250 seat (400 standing) octagonal rat pit Kit maintained in the basement. The Sportsman Hall was housed in what’s considered to be the third oldest building in Manhattan (1773), which is now called the Joseph Rose House and Shop. Kit Burns and his competitors in the rat pit game are a big part of the reason that the ASPCA was formed back in 1866. Kit died in 1870, and is buried in LIC’s Calvary Cemetery along the Newtown Creek. Born Christopher Keyburn in New York City on February 23, 1831, Burns joined the Dead Rabbits as a young man and, by the late 1840s, co-led the organization with Tommy Hadden. Both men started their own businesses in the Bowery with Burns opening his Sportsmen’s Hall on Water Street. His establishment was widely known for holding illegal bare-knuckle boxing prize fights as well as featuring such entertainment as the infamous “rat pit” where blood sports such as rat and dogfighting took place. In these events, large gray wharf rats were captured and set against dogs. These dogs, mostly terriers, were sometimes starved for several days beforehand and set against each other as well. Not too far away, over on Canal and Lafayette, is what was once known as the Bruce Building – 254-260 Canal Street. George Bruce was a rather successful printer when he started to build his NYC headquarters back in 1856. The Bruce Building was converted over to office space back in the late 1980’s, but what makes it really special are the iron works which dress the walls. They’re the (1850) patented work of James Bogardus, according to prevailing opinions. 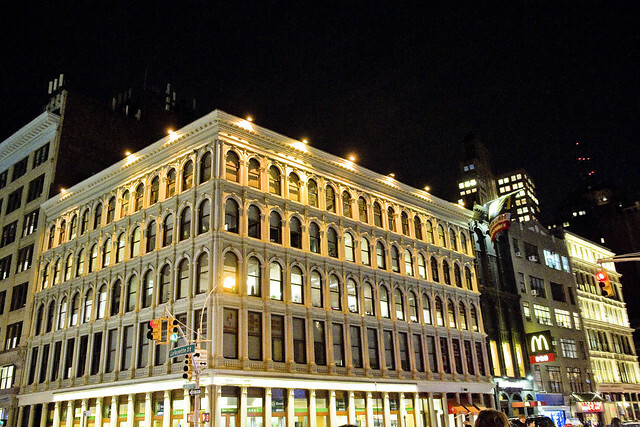 Bogardus was the guy who pioneered the cast iron facades commonly seen on Victorian era buildings in NYC and elsewhere. James Bogardus is buried in Greenwood Cemetery, but he was a descendent of Dominie Everardus Bogardus, who died in a ship wreck in 1647. Dominie Bogardus was granted a piece of property by the Dutch colonial government across the river from Manhattan, a point of rocky land surrounded by swamps and salt marshes, which came to be called “Dominie’s Hoek.” It adjoined a fertile waterbody still called the Mispat, but which we know today as the Newtown Creek. The LIC saloon “Dominie’s Hook” is named after him. In 1825, the Hunter Family acquired the Hook, and its been called Hunters Point ever since. The Reverend Everardus Bogardus (1607-1647) was the dominie of the New Netherlands, and was the second minister of the Dutch Reformed Church, the oldest established church in present-day New York, which was then located on Pearl Street (Manhattan) at its first location built in 1633, the year of his arrival. Bogardus was, in fact, the second clergyman in all of the New Netherlands. (The slightly obscure early history of the Dutch colony meant that he was often considered the first clergyman.